GORHAM—Gorham dropped their second straight on Thursday afternoon, falling at home 3-1 to Deering. 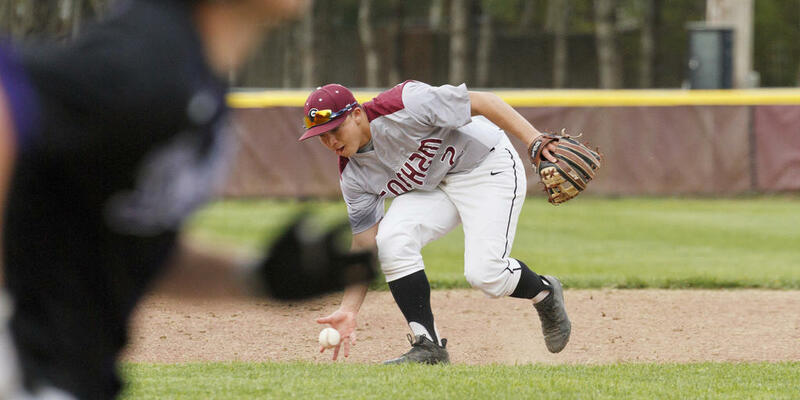 Offense has been Gorham’s problem of late – their lone run came in the second when Nolan Brown scored on a Lucas Roop single – and even respectable pitching and fielding hasn’t been enough to settle them into a groove. Deering’s first couple batters – Jack Lynch and Luc Harrison – grounded out to short and flew out to center, respectively. When Keagan Stanton-Meas stepped to the plate, however, kismet smiled on the team: Stanton-Meas singled to reach base, advanced 90 feet when Brown (Gorham’s starter on the mound) tried to pick him off at first but whipped the ball a little high, and ultimately rounded to home during Luke Hill’s ups. Gorham’s first at-bats turned up no runs. David Drew grounded for the team – Drew reached base on an error by Deering shortstop Alex McGonagle – and soon stole second, but his teammates in the batter’s box couldn’t keep him moving: Kyle King lined out to right and Brogan McDonald struck out to close the inning. Deering went up 2-0 to start the second. Brown hit No. 6 batter Bobby Ridge with a pitch – hit him in the ankle – then walked McGonagle for two men on. Ridge slid over to third on a Mike Jones sac bunt and scooted home on a Caleb Delano single. Gorham responded in the bottom of the second. Brown, batting fifth in the lineup, singled; he stole second during Will Prescott’s at-bat and grabbed third when Prescott grounded out to short. Finally, Roop brought him home, belting a beautiful drive to center. The well dried up for Gorham after that – for Gorham, but not for Deering. Deering added their third run, the 3-1 run, in the top of the sixth. Brown lured Ridge into a 6-3 groundout to open the stretch, but then nailed McGonagle in the elbow. McGonagle would shortly find his way across the plate. Three runs isn’t that many; Gorham’s pitching and their fielding kept them alive, kept them in it, despite logging a handful of key errors. Their bats were what let them down. “We’ve got some work to do on defense as well,” Nadeau said. “And in a game where you’re really struggling offensively, to go from 2-1 to 3-1 late in the game on a play that really should’ve been the third out, mentally it wears on you. Gorham certainly can hit – make no mistake about that. The team has tallied 39 runs in seven games, including 15 against Falmouth, who aren’t having their best season, but who can hardly be called “bad.” Gorham has simply fallen into a bit of a slump, and a slump can be a difficult pit of quicksand to escape. Gorham’s other recent loss, an 8-3 defeat at South Portland, unfolded on Tuesday the 8th. Still, the Rams remains on the plus side of .500 at 4-3. They opened their schedule with a win over Cheverus, before slipping to 1-1 vs. Biddeford. A trio of victories followed – against Bonny Eagle, Scarborough and Falmouth; they match up at Thornton Academy on Saturday the 12th, and host Massabesic on Tuesday the 15th and Sanford on Thursday the 17th. Deering improves to 5-2. These Rams kicked off their spring a 6-5 victory over Windham, who currently sits in first. They suffered a 5-0 beating when Scarborough came to town, but then slipped past Massabesic, crushed Westbrook and dispatched Kennebunk. Prior to dropping in on Gorham, they stumbled hugely – to the tune of 13-3 – at home against Biddeford. Next up: a road battle at Marshwood. Gorham’s Ben Nelson barehands an infield grounder as the Deering batter heads for first. Gorham’s Nolan Brown launched a deep double into left-center in the bottom of the fourth; he lucked out and extended his run all the way to third when Deering baseman Dan Hill couldn’t quite keep his glove on the throw. Gorhamite David Drew steals second; Deering shortstop Alex McGonagle fields the throw. Gorham’s Trevoer Loubier – who took over at third when Kyle King moved to the mound – reaches for an incoming Deering grounder. Gorham’s Brogan McDonald slides off second, eager to make a break for it. Trevor Gray leads off third for Gorham. Gorham centerfielder David Drew gets underneath an easy flyball. Gorham shortstop Ben Nelson hurls an infield grounder toward first. Gorham third baseman Kyle King watches the action at home. Gorham outfielder Lucas Roop races to grab in incoming flyball. Lucas Roop leads off third for Gorham. Roop wouldn’t make it all the way home, unfortunately – one of a couple instances on Thursday when Gorham left men stranded on base. Gorham pitcher Nolan Brown fields a Deering sacrifice bunt.